The most leading operating systems are distributed among Android, Rim and Apple. According to new numbers from the Nielsen Company the most popular smartphone operating system in the USA is Google’s Android. It turned out that Android has occupied 29% of the minds and hearts of the smartphone users, whereas Apple’s iPhone and Research In Motion’s Blackberry reach out for 27% each. These findings differ a lot from a report released by Nielsen in December that testified the iPhone had approximately a 4% advance on its Google competitor. The December findings also notify that iPhone and Android were equally desired among United States users. In an attempt to appease the iPhone’s increasing fan base, Nielsen also added that as to manufactures popularity, Apple and RIM are the largest. But if to measure by this stick it seems a little bit unfair as both Apple and RIM generate their own hardware whereas Google’s Android is a software platform which available on devices from many manufactures. It seems to be interesting to note the chart by Nielsen which shows his classification of smartphones users by age. Concerning smartphones popularity there shows up a small difference how the brands spread among the same age groups. For instance, Apple and Android every have 8% of smartphones users aged from 25 to 34, whereas RIM has 7% of the same age. Such one percent point difference is a small one and there are similar results almost in every age category. There is only exception of smartphone users aged from 18 to 24 range, where Android has an advance of 2% points over RIM and Apple, but once more this difference is rather insignificant. 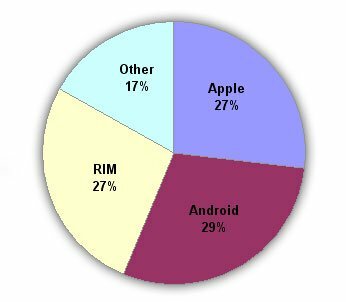 This report is comparatively good news for Android and Apple, that turn out to be dominating United States smartphone’s operating systems market, while RIM has been weakening market share for some quarters. But the findings also show that the rival smartphone platforms have a long way ahead to surmount this three market leaders. Microsoft mobile devices popularity has gained just 10% of United States users, including the mature Windows mobile platform as well as the new Windows Phone 7 OS. WebOS is more behind Microsoft 4% of users, but it may change with a resumed attempt from new owner of WebOS, HP. Meanwhile doomed Symbian platform from Nokia takes a piteous 2% fan base. Nielsen’s inquiry comprises of findings collected from 14, 701 (people with cell phones contracts) owners of smartphones between November and January.